We offer a range of other on-site machining, boring, welding, and valve repair & testing services. Our line boring machines support boring diameters from 1.375 to 80 inches (35 to 2030 mm), with the precision and speed of stationary machines. The automated welding systems are designed to attach directly to the boring machine mounting fixtures, allowing a single setup for both welding and machining operations, giving the operator the ability to weld one bore while machining another. Our automated welders offer high-quality, affordable welding performance for bore, flange and valve repair. Line Boring: Line boring of heavy construction equipment buckets and articulated joints, Drag line housing repair, Drilling of frozen studs or realignment of slew ring bolt holes, Heavy equipment and crusher gearbox repair, Line boring of dam wicket gate bushings, Ship stern tube and rudder leaf boring, Re-boring of turbine shell housings, Turbine coupling boring. Bore Welding: Valve and pump repair, Motor housings and shafts, Bores, pivot points, buckets and hitches, Shaft OD repair, Rotary crushers, Loader bucket & hitch repair, Gears and gear boxes, Compressors and turbines, Nozzles on pressure vessels and heat exchangers, Continuous miners and drag lines, Mud pumps, Rudder Bore, Hydraulic cylinder eye, Presses, Castings and injection molds, Jaw crusher pitman arms. Our valve grinding and lapping services span working ranges for gate valves from 1.3 to 39.4 inches (32 to 1000 mm) and Globe valves from 0.4 to 24 inches (10 to 600 mm) as well as conical seats. Our testing systems are designed and engineered to provide the most advanced equipment and accessories in the industry today. We specialize in Hydrostatic Valve Test Equipment and Pneumatic Valve Test Equipment. Wherever equipment repair applications involve milling critical mounting surfaces, we have precision machining solutions that can be perfectly configured to fit. 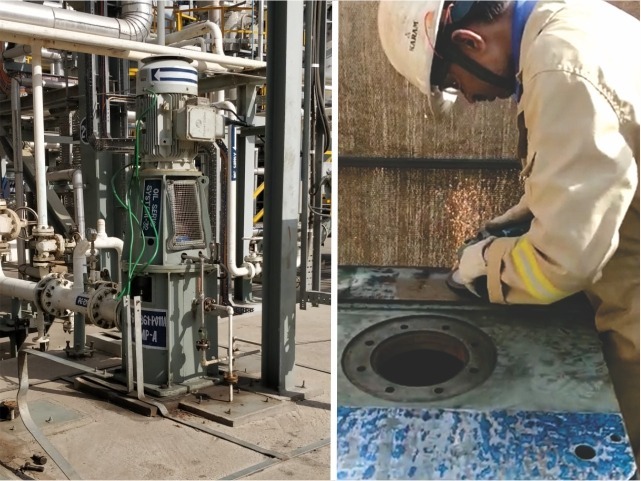 Blue matching is an important process in infrastructure maintenance in a refinery. It ensures the equipment like pumps are erected properly and sturdily. ABS provides Blue Matching services through its third party validated skilled technicians.